You know how some people like to say that you can never learn anything from watching television? Well, the folks at Kultur Entertainment have put together a series of documentaries that proves that adage wrong. Called the Great Writers Series, these 45-minute films take viewers behind the scenes of the life and times of some of the greatest novelists of the 20th century, including Truman Capote, John Steinbeck, Tennessee Williams, and William Faulkner. In fact, Great Writers: William Faulkner is now available on DVD. Featuring insightful commentary, archival documents and rare interviews, it’s a thought-provoking look at Faulkner’s life, as well as the politics and social events that helped shape his writing. Are You Being Short With Me? The short story form is something I have yet to master, yet it’s a form I love returning to again and again in my reading. As Kurt Vonnegut once said, short stories are like “Buddhist catnaps.” While even the bad ones can be a form of escapism from day to day activities and easily forgotten, some rise to the level of art and can be as complex, challenging, and unforgettable as the greatest of novels. Having just finished reading James Joyce’s short story collection, Dubliners, I was inspired to create a brief list of the greatest short stories I’ve ever read. I was also tempted to include “The Turn of the Screw” by Henry James, though that is officially considered a novella, and at 80 some odd pages, it is rather torturous to get through (which is part of the suspense of it all). What stories would make your list? Any writer worth their salt knows that social networking sites like MySpace are a great way to meet fellow writers and hopefully some readers as well. I am currently featured on MySpace’s Word Weavers for the week of 1/13/2008. D. H. Schleicher holds a background in Psychology and Criminal Justice from his undergraduate days at Elon University in North Carolina. Always a crafty storyteller as a child, Schleicher honed his skills in college where his studies fueled his ideas and helped him develop his characters. Schleicher took many chances early on by self-publishing three psychological thrillers over a course of two and half years after graduating college in 2002. His projects were unmitigated disasters, but provided him valuable lessons. Sometimes a writer must learn the hard way and must write a lot of garbage before finally writing something worthwhile that will connect with audiences. That breakthrough came in late 2006 with the publication of The Thief Maker. Here Schleicher finally found his voice and delivered a dark, psychologically complex, intertwining tale of love, hate, and crime on the streets of Philadelphia and New York City. The Thief Maker has been earning rave reviews and accolades (including Honorable Mention in the Genre Fiction category in the upcoming Writer’s Digest 15th Annual International Self-Published Book Awards) over the course of the past year. Schleicher has employed a slow-burning grassroots marketing campaign built on the strong word of mouth from readers and critics and his always lively blog where he discusses films, books, current events, and shares his trials and tribulations with self-publishing and living the writer’s life. The author finds endless inspiration from his love of films and books. He believes you learn to write well by reading as much of the classics as you can, but also by reading some of the bad writing (be it one’s own experiments from the past or current best-sellers that are less than stellar) to know what to avoid in one’s own writing. His favorite novelist is Graham Greene while his favorite film director is Stanley Kubrick. Schleicher is currently working on his next evolution as a novelist while residing in the suburbs of his favorite city and muse, Philadelphia. The Thief Maker is on the shelves at Philadelphia and South Jersey area Barnes & Noble stores and available for purchase worldwide through Barnes & Noble and Amazon.com. ‘Tis the season to be jolly with my friend’s niece Molly. I bought her a dolly, and she named her Holly!! Okay, I’ll stop. I always look forward to Christmas. Although I hear many a heavy sigh, followed by “not again,” it’s never too much for me. I love it all; the decorations, baking, the sweets that none of us should eat, the shopping, the presents and the wrapping, the music, the Christmas cards, friends coming over for tea, the hugging and the all encompassing reason for the season. I embrace every minute detail! My cats, Kitty, Pearl, Cybill and Seven, can’t possibly comprehend any of that, but they seem to love the holiday season even more than I do. Normally, we’re a fairly laid back household. I can’t get the furry ones to do much more than sleep, eat and make deposits in the litter box during the rest of the year. And I’m usually the only one who moves toward the door when the bell rings and when people enter, one might hear the lack of traction on the kitchen flooring because the furry foursome can’t become invisible fast enough. 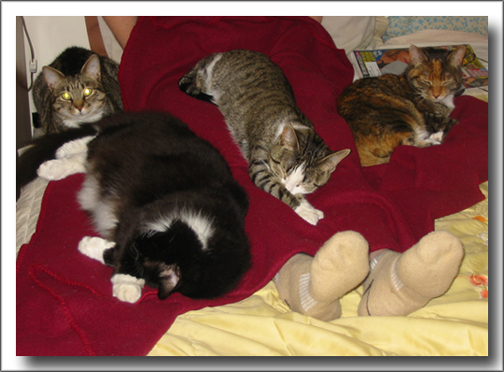 Some people don’t believe I have cats, they never see them (even the pet sitter) until Christmas time. I was even accused of renting them just for the holidays. But when the season begins, my “hideouts” are definitely under foot. They want to see everything and everybody. The postman is exceptionally exciting because he usually has a box to open, which means they get to watch me remove presents, which they sniff audibly and when the box is empty, they jump in. There’s some pure joy current in the air that truly has an affect on them. It begins when the tree and boxes of decorations come down from the attic, watch out, they can hardly contain themselves. Fortunately they are not destructive, they just want to see and be a part of everything. They paw the ornaments before I get them to the tree and visit each light on the strand as it lays across the carpeting during testing. After the tree is up and decorating completed, my furry children want to be near it, either on the arm of the sofa, sitting in front of it gazing at the twinklings or under it but fortunately, never in it. Christmas Carols will bring them close to the stereo or radio. Kitty and Pearl don’t seem to mind how loud I play them. Presents are something to rub against or lean their heads on when they snooze. You won’t find our cats approaching anyone throughout the rest of the year, but during the holidays, they want a pet from everyone. They even become so bold as to jump into a strange lap or two. They get ecstatic when we open gifts on Christmas morning. They are simply so thrilled to roll around in the wrapping paper that it appears they have been waiting for this special treat all year (and there is no presence of catnip). Their unusual behavior at Christmas always astounds but warms me. 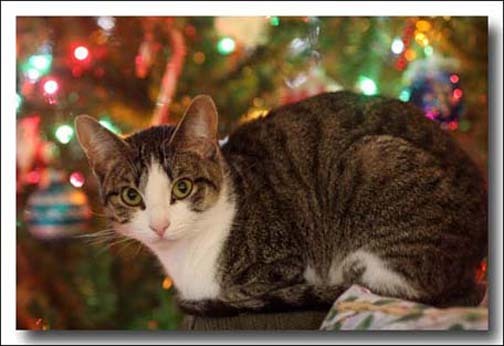 May you, also, enjoy some of this strange behavior as our paws pause for Christmas. Savor the holiday moments, connect with those you love (or merely tolerate), sniff all the Christmas goodies, feel the vibrations of some great carols and jump on a lap or two. I remember reading a verse that goes something like: “When you worry and hurry through your day it is like an unopened gift . . . thrown away. Life is not a race. Take it slower and hear the music, before the song is over.” Those wise words shared with me are a regift from me to you. Please carry them with you to 2008. Lost isn’t just fun to watch, it also makes you think, posing questions about life, love, survival, transformation, destiny and happenstance in virtually every episode. That’s the focus of Lost and Philosophy (Wiley-Blackwell, 2007), a collection of 21 thought-provoking yet reader-friendly essays that explore the many references to philosophy in the popular ABC series, which is scheduled to return for its fourth season in February 2008. I recently spoke with the book’s editor, Sharon Kaye, associate professor of philosophy at John Carroll University in Cleveland, for The Wave Magazine. Click here to read the complete article, which appears as part of the magazine’s regular Spotlight feature. What is the Greatest Novel of All Time? Fall seems like the natural time of year for list making.